Today, we are happy to announce the general availability of Gitora 2.0. We listened to the feature requests coming from the community and we think we are addressing the majority of them with this new version. Gitora now supports Object Types. Object Types are supported for the Oracle version 11g and above. Gitora 2.0 helps you create diff scripts between two commit points in your Git repository. Simply, enter the starting Commit Point ID and the target Commit Point ID and Gitora will generate a diff script for you to run in your target database. Gitora 2.0 supports cloning Git repositories from remote databases. Connect your local Gitora to the remote Gitora (which manages a remote database) and move the code base from one database to the other automatically. Similar to cloning, developers can now pull(merge) source code from a remote database to the source code in a local database automatically if both database are running Gitora 2.0. – Cancel any edits made to a PL/SQL object since check-out by clicking a button. Every feature from Gitora 1.0 continues to be free in Gitora 2.0 Community Edition. We even added new features to it such as object type support, ability to view changes made in each object and canceling edits, along with many bug fixes. We believe proper version control is a big problem in the PL/SQL community, hurting the productivity of many PL/SQL developers and discouraging organizations from using PL/SQL. We think we can help. 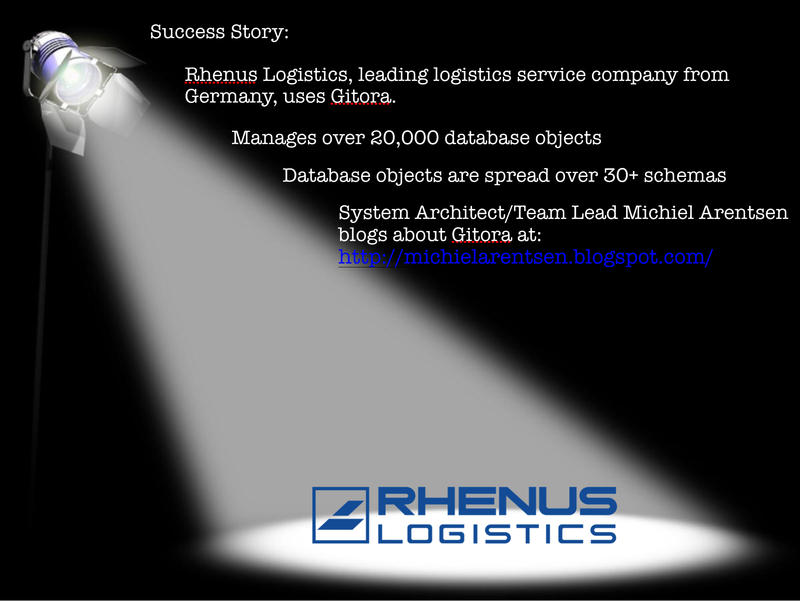 In order to justify further development on Gitora to help the community to solve this problem, remote database features in Gitora 2.0 will be available in the professional addition. The professional edition also comes with email support and unlimited access to 2.X released of Gitora. We think the benefits you will get from Gitora Professional Edition will far outweigh the small price tag we put on it. We know that large enterprises usually have their own unique needs. They might need customizations, new features, integration with other products and services they use, training, more timely and intensive support covered with an SLA etc… For these types of customers, we offer a fully customizable version of Gitora. Gitora 2.0 Professional Edition comes with a long trial period and even if you decide not to purchase it, it gracefully downgrades to the community edition. If you are building applications with PL/SQL, we invite you to our webinar on July 7th in which we will introduce the new version of Formspider, the development framework for PL/SQL developers.